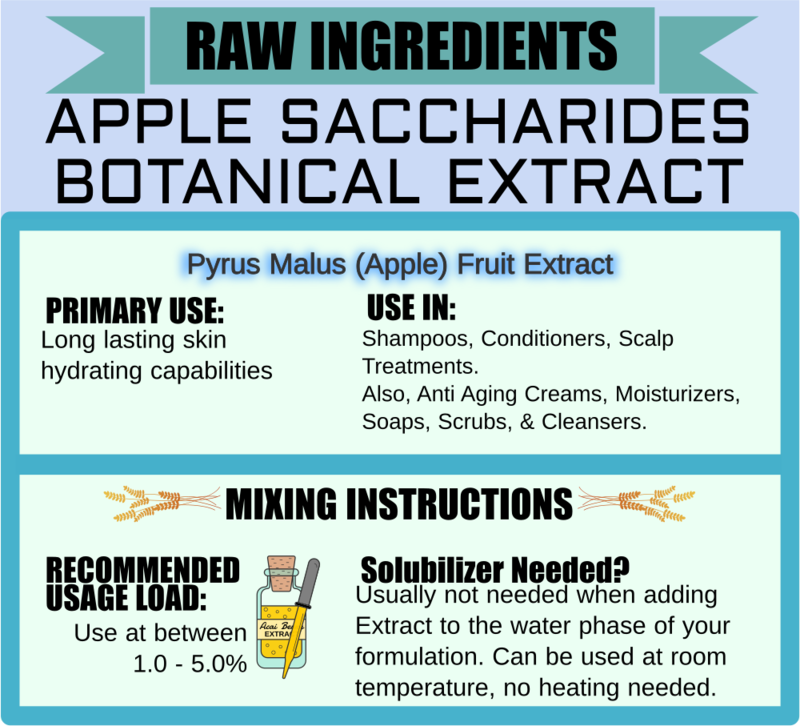 A promising new water soluble ingredient derived from dried apple extract that has incredible hydrating capabilities. A promising new water soluble ingredient derived from dried apple extract. Scientific testing of Apple Saccharides has revealed impressive hydrating capabilities: 88.9% increase in skin hydration after only 30 minutes. The effects are long lasting - even after six hours; hydration remained 32.5% higher than untreated skin. This is nature at its finest! Why do we prefer extracts in liquid form? They are easy to use in bases and do not normally require heating to be properly mixed in. Many customers have expressed frustration when attempting to incorporate extract powders into viscous formulations due to issues with powders not fully dissolving. Our goal is to keep this as easy and enjoyable as possible! Testing for desired results is recommended but we suggest 1.0% - 3.0% in sprayers, up to 5.0% in aloe gels, and maximum of 10.0% in lotions and conditioners. I love this product. Using it in my most recent formulation and it helps keep moisture in the hair. I began including this in a hair formulation my company is working on, and I am so pleased. It pairs well with other humectants creating an atmosphere for moisture retention. I am so glad I discovered this ingredient, it is wonderful.